Ewing M. Kauffman Stadium, Kansas City. 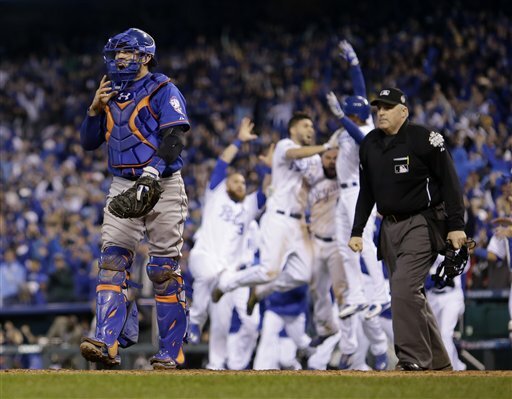 The World Series was setup to be a fantastic matchup between the Mets & the Royals, it's the best pitching vs the best hitting. Game one is held in KC & it was a dandy till the end. Volquez got a quick start when Granderson and Wright both popped up and he had Murphy swinging. For KC, they started off fast when Escobar hit an inside the park homer run when Harvey pitched against him first to make it 1-0. Harvey got through a jam in the second when two guys were on base with one out, Rios flied out while Escobar grounded out. He's been looking good since that rough first inning.It looked like it would be a quick third inning but with two outs Volquez hit Johnson & walked Granderson. The count was 2-2 against David Wright, and Volquez had him looking to retire the top of the inning. It was a key part in this game since he got out of the big jam. The Mets needed their hitting to get them going, and who else but Daniel Murphy started them off with a single. After Cespedes popped up, Duda hit a single to right which allowed Murphy to get to third. d'Arnuad hit a hard ball to third which didn't allow Moustkas to catch but he saved another run, he wouldn't have made a play on it either way but it was tremendous effort. Conforto then popped up to third while Flores had a force out to second to end the top of the side. 1-1 going into the bottom of the fourth. David Wright made a spectacular grab that saved a potential double to end the fourth. With one out, Curtis Granderson homered to right field to give the Mets the lead of 2-1! Other than that, the Mets bats were quite other than the homer in the fifth. Flores made a phenomenal play with two outs that barely got to first base to get Escobar out, the Mets defense have been playing great ever since that one error by Cespedes in the first inning. To start the sixth, Cespedes got his first hit of the night when he barely singled to center field through the shortstop. Duda would answer with a base hit of his own that advanced Cespedes to third with no outs. Volquez had a clutch strikeout that had d'Arnuad guessing. Conforto popped up to left field that had Cespedes tagging home and Gordon couldn't get the throw there in time. 3-1 Mets with a runner on second. Moustakas made such a clutch diving stop that ended the top half of the 6th that saved a run. Zoubrist doubled to start off the 6th and Cain hit a base hit that had the runners at third and first with nobody out, Hosmer hit a sac fly that drove Zoubrist in for a run to make it a score of 3-2. After Cain stole a base, Morales grounded out and Moustkas had an RBI single that tied the game at 3! Perez flied out and after 6 we got a tie game at 3. Duffy took over Volquez in the 7th, after the two outs they took him out for Herrera who let Murphy and Wright get on base with two outs. But Cespedes popped up and that ended the top half of the 7th. Reed who toke over Harvey in the 7th as well, had a quick one two three inning. Flores drove in a run after Hosmer made an error at first base, the Mets were leading 4-3 going into the bottom half of the inning. Clippard came into the game and with two outs he walked Zoubrist that put runners on the corners, Familia ended the inning when Moustkas grounded out. 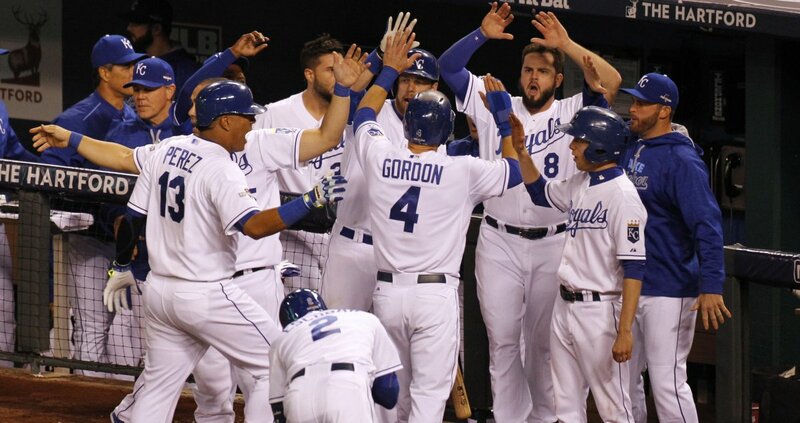 With one out, Gordon homered to center field to tie the game at 4 in the 9th! We headed to extra innings with the score being 4-4. After a tremendous bunt by Largares, Flores laid down a bunt as well that moved Largares to second base with one out. The Royals got out of the jam, we headed to the 14th later on and the bases were loaded with no outs and Hosmer hit a sac fly that brought the winning run in that helped the Royals take a 1-0 series lead. 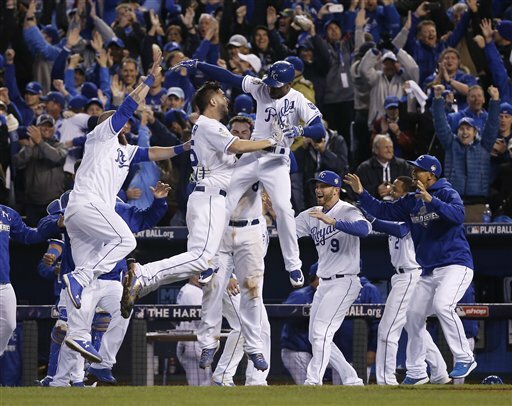 Stats: Win: Young (1-0) Loss: Colon (0-1) It was the longest World Series opener ever, it lasted 5 hours and 9 minutes. 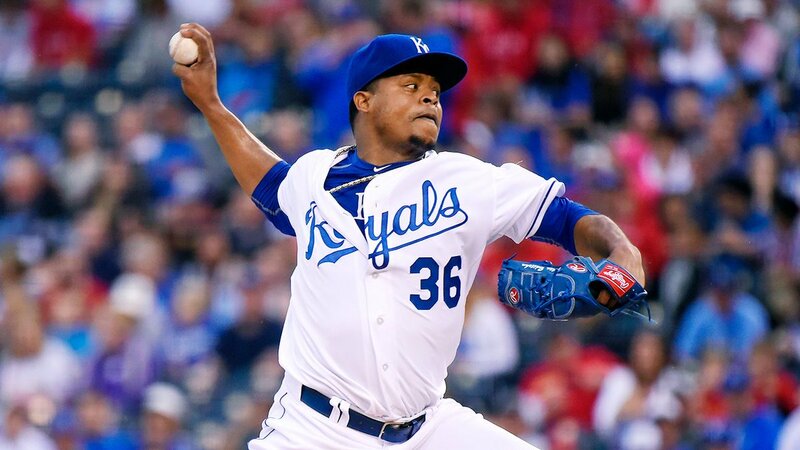 Volquez: 6.0 IP, 6 H, 3 ER, 3 SO, 4.50 ERA. Harvey: 6.0 IP, 5 H, 3 ER, 2 SO, 4.50 ERA.